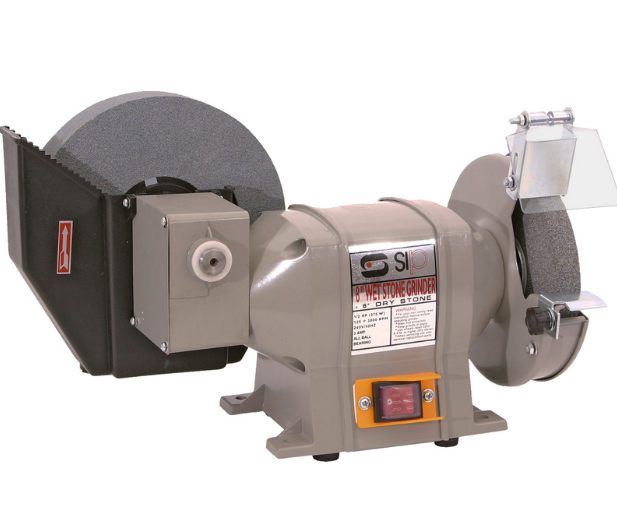 Since the difference of price between a regular wet grinder and the finest (and expensive!) Tormek is huge, I would like to know if it's possible to use a standard model like the one in the picture. You should never use a dry bench grinder on any of your gravers this will take the temper out of the steel and render it useless for cutting. The wet stone grinder that you have shown is good, but you may want to change the stone to a finer grit, these are normally white in colour, once you have honed your graver you just need to keep the edge on them with your oil stone, it should take quiet a while before you use the wet stone again to take some of the top angle off, the idea of this is so you can see the cutting tip better. One can buy a black silicon carbide in a fine grit. The issue is the white stones are friable and do not build the heat as much. One can use a highly-friable dry stone and not overheat the fine edges. It takes a brief, light touch. Color the tip with a permanent marker, leave the slightest of a flat on the edge and hone it to the desired edge. I use Shapton stones beginning at a coarse to 8000 grit on my chisels, knives, etc. I have several bench and large floor-standing grinders, including a 14" wet grinder (a converted AMMCO brake lathe). The Tormek really is all that if you have more than just a handful of tools to grind. I use it on everything from carving to turning tools, chisels, redoing of kitchen knives and much more. The Tormek clones are hardly worth the time unless one has only a few tools to grind. Thanks for the advice. Yes, I had to re harden and temper several of my gravers after my dry grinder made them lose their hard. I am also considering to purchase a Scheppach wet grinder. Of all Tormek alternatives, this seems to be the one with better reviews. Any opinion? With carbide chisels I usually forgo the bench grinder for a few passes on a Dia-sharp whetstone. Not sure if you're needing to reshape the graver too, our application varies. I typically only need to sharpen, square a corner, or correct an angle. @Wes Adams Thanks for the advice, but please notice that tiny steel gravers are way more fragile and prone to lose their hard than carbide chisels. The turn red in a matter of seconds if you use a dry grinder. That's why using a bench grinder seems too much. Even with hard chisels I usually sharpen by hand instead. Regardless of the sharpening surface, your variables are speed and grit. 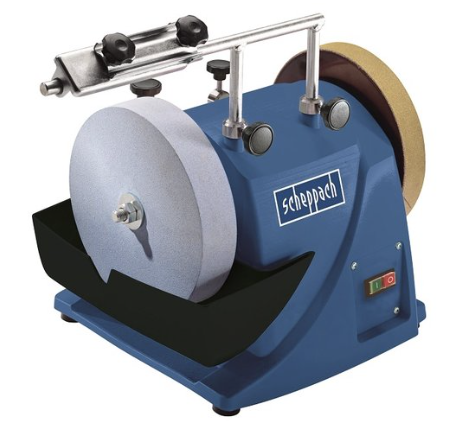 I am a woodworker with some experience of the Sheppach wet grinder. I bought one from Grizzly; apparently they are the same Chinese-made machine, sold under several brand names. There is a third I think, I've forgotten it. I bought one to try and avoid the expense of a Tormek. The major drawbacks to the machine are these: the motor is poor. You can slow the wheel down, even stop it, even with what seems like moderate pressure. The Tormek has a pricier motor which doesn't falter. Also my wheel wobbles, and from what I've read that is a common problem. This machine uses cheaper materials for the shaft than the Tormek. However Tormek tools fit the crossbar on the Sheppach/ Grizzly. I couldn't get a straight edge on a chisel, because of the wobble, until I bought a Tormek truing tool; it wears the wheel away and compensated for the wobble. So it is a way to get a cheaper grinder, that runs slow and is water cooled; but not without its issues. With small gravers you may not have any issue with the motor. I would recommend getting the truing tool if you get one. You asked the question in June so may have solved your problem by now! ... please notice that tiny steel gravers are way more fragile and prone to lose their hard than carbide chisels. That's why I only use hand grinding stones for my wood carving chisels and planes. You have way more control and there is no way to ruin the temper. I use a variety, running from course to extremely fine Japanese water stones and diamond hones. Yes, some water passed under the bridge after I made the original questions. I purchased the Sheppach wet grinder and yes, its motor is weaker than the Tormek. However, I found out you can shape your gravers well with it. The rest of the work is done with a Norton india stone and a white Arkansas stone for the finer sharpening. Nelly Gable thought me how to do it well and I am glad my gravers now can dig on steel way more comfortably than in the past.